Yes, i provide attic ladder installation (your ladder) in central Indiana, so let me take care of your attic storage problems. You will be much safer not using that rickety step ladder. When i install your ladder, the legs are straight! That means NO crooked ladder. Installing Attic Stairs makes taking down and putting up those holiday decorations much nicer too. Life is easier! I serve Indianapolis and surrounding towns and cities (areas served). “How much does it cost for attic ladder installation? It depends on the ladder you buy at the big box store. 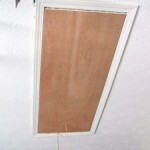 The cost for an attic ladder with installation can vary between $ 250.00 and $ 650.00. $ 249.00 labor cost for Standard opening width (No joists have to be cut). Includes trim around the opening (see photo). Add $80.00 for me to remove an existing ladder (I cannot dispose of old ladder). “For ceiling height of more than 10 feet” – I will install it but i DO NOT recommend a folding ladder with tall ceilings. The ladder becomes difficult to operate, even for a 6 foot tall person. A retractable ladder works better. On site quote given for labor cost for Standard opening width (No joists have to be cut). 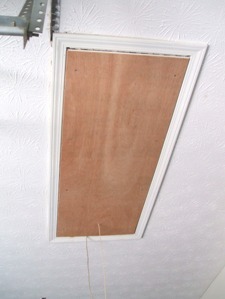 A longer, more expensive folding attic stair is required for ceilings over 10 feet 3 inches (depends on the brand) and usually has to be special ordered. On site quote given for labor cost for Wider opening width (joists have to be cut). Note: Wider opening is not available if your attic framing has “trusses” for support. You will have to use a ladder for a standard opening (fits between the joists). Call 317-207-4668 for more information. If you still have an old wooden ladder, you’re no doubt familiar with those big, creaking springs. When you folded it up and let go of the rope, the door slams shut and blows dust everywhere! They typically cost less than the aluminum and other styles. You can buy them to fit “in between” your attic joists (22 1/2 inch opening) or go even wider (25 or 30 inches). The extra width makes it easier to get in and out of the attic. If you do go wider, the joists will have to be cut and “framed” or “boxed” in. This adds some time and cost to the attic ladder installation. Remember though, if your attic has truss supports you will have to use a ladder that fits in between the joists. These can be purchased at the big box stores and do cost a bit more than the standard duty wooden units. Another bonus of the aluminum type is that most use a gas cylinder setup for closing. It’s quieter and smoother. Like the wooden type, you can get them to fit a wider opening (25 or 30 inches) but again, this will add to the installation cost. Measure from floor to ceiling. This determines what size ladder to get. If your ceiling is over 10 feet 6 inches high, you will have to use a longer attic stair, which adds about 100.00 to the cost. A cheaper alternative is to use the standard length ladder and rest the ladder legs on some lumber (i can build a small platform for you for $ 30.00). Wood or aluminum? Either one will do the job. Aluminum is a bit lighter and easier to operate. Standard duty or Heavy duty? Standard will support up to 250 pounds. Heavy duty will support up to 350 to 375 pounds. Purchase ladder from your favorite home improvement store and call me to install it. If it won’t fit in your vehicle, i can pick it up for you. If you would like help in selecting the right ladder or want to schedule an attic ladder installation, just call 317-207-4668. You can also click on the contact link below….